Szechuan Stir Fry | What Smells So Good? 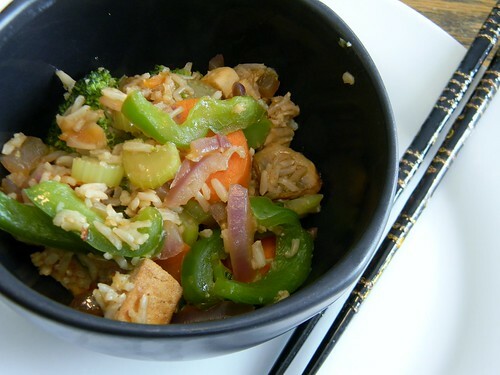 We are a family of stir-fry lovers. Pretty much, if you can toss it in a saute pan with a ton of veggies, a little sauce of some kind and pair it with a carb, it's fair game at our table. Since my mom is now retired, there's a wedding coming up in the near future and meat is ever-more expensive these days, meatless meals have become routine - like it or not. Although my stepdad is a little resistant to the shift, my mom and stepbrother are gladly embracing it... especially since my stepbrother would rather eat tofu than chicken or turkey! The key to any good stir-fry, regardless of whether it's meat, seafood or tofu, is to season well, and often. Yes, the pan's heat adds an element of "browned" taste to the food, but without those key basic spices, herbs and sauces you might as well just steam the food. I was lucky enough to still have some Szechuan sauce from San-J in my fridge (we love that stuff), and I used it as a jumping-off point for our dinner - marinating extra-firm tofu in it overnight, before using a mix of tamari, apple juice, ginger, garlic and even more Szechuan sauce as a finishing flavour punch for a pan full of caramelized tofu, tons of veggies and brown Basmati rice. Not only did the combination taste fantastic - a blend of tangy, sweet and spicy - but it used up all sorts of leftovers (which for the uninitiated is really the purpose behind stir-frying anything!). We even had enough left over for my mom to take for lunch when she volunteered at my school - a meal that garnered very interested looks from everyone in the lunch room! Cut tofu into small cubes and place in a shallow dish. Drizzle with 1 tbsp Szechuan sauce, cover and marinate overnight. In a small bowl whisk together remaining Szechuan sauce, apple juice, tamari, ginger, garlic, pepper flakes, water and tapioca starch. Set aside. Heat oil in a deep skillet over medium heat. Add the onion, carrots and celery and cook until softened, about 6-7 minutes. Add pepper, mushrooms, broccoli and tofu, raise heat to medium high and cook 5-6 minutes longer. Add rice and sauce. Cook, stirring, until sauce is thickened and rice is hot, about 2 minutes.